I found a cool website that allows the user to tinker around with the states to configure any number of potential election scenarios. 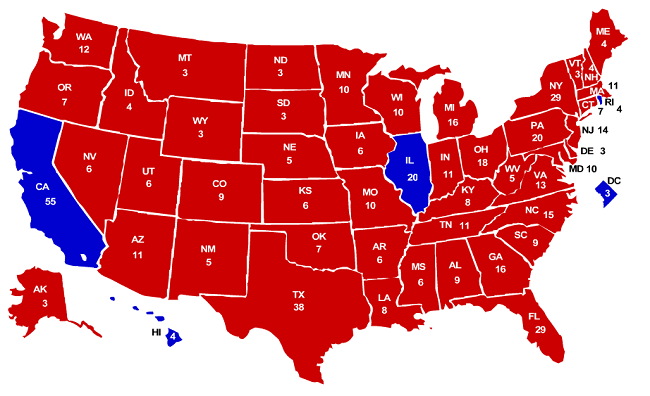 The map is shown with 2012's electoral view in a tie, with Obama states in blue and Generic Republican states in red. You can click on the map flip states to Republican red or Democrat blue depending on what you think might happen with any given match-up. States also can be flipped to neutral so you can account for potential toss-ups. Perhaps most importantly, the tally for the electoral college changes in real time as you make changes. For deeper analysis, you can compare with previous years' results (e.g. 2004 and 2000). When you're done, you can share your map with friends via email, Facebook, Twitter, etc. with easy-to-use buttons on the page. I think more than one of the Republicans running for president could pull off something like this, don't you? PS: This chart is very helpful. UPDATE II: Yikes! This one is very interesting. Nice looking map! Except for the part where it's a squeaker of a win... Reality perhaps, Bu I say, if we're gonna wish, wish big! Beautiful. What happened to Rhode Island? I think Prof Jacobson at Legal Insurrection would feel left out. I just missed it... Should have left Mass as it was though. Dark Blue! In Gallup polls since 1944, only about 20% of the public has supported the current system of awarding all of a state's electoral votes to the presidential candidate who receives the most votes in each separate state (with about 70% opposed and about 10% undecided). Support for a national popular vote is strong among Republicans, Democrats, and Independent voters, as well as every demographic group in virtually every state surveyed in recent polls in closely divided Battleground states: CO - 68%, FL - 78%, IA 75%, MI - 73%, MO - 70%, NH - 69%, NV - 72%, NM-- 76%, NC - 74%, OH - 70%, PA - 78%, VA - 74%, and WI - 71%; in Small states (3 to 5 electoral votes): AK - 70%, DC - 76%, DE - 75%, ID - 77%, ME - 77%, MT - 72%, NE 74%, NH - 69%, NV - 72%, NM - 76%, OK - 81%, RI - 74%, SD - 71%, UT - 70%, VT - 75%, WV - 81%, and WY - 69%; in Southern and Border states: AR - 80%,, KY- 80%, MS - 77%, MO - 70%, NC - 74%, OK - 81%, SC - 71%, TN - 83%, VA - 74%, and WV - 81%; and in other states polled: CA - 70%, CT - 74%, MA - 73%, MN - 75%, NY - 79%, OR - 76%, and WA - 77%. Americans believe that the candidate who receives the most votes should win. The bill has passed 31 state legislative chambers in 21 small, medium-small, medium, and large states, including one house in AR, CT, DE, DC, ME, MI, NV, NM, NY, NC, and OR, and both houses in CA, CO, HI, IL, NJ, MD, MA ,RI, VT, and WA. The bill has been enacted by DC, HI, IL, CA, NJ, MD, MA, VT, and WA. These 9 jurisdictions possess 132 electoral votes -- 49% of the 270 necessary to bring the law into effect.